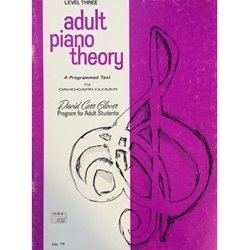 This book by David Carr Glover was designed to reinforce the fundamentals of music being studied in the Adult Piano Student Level 3, but it can also be used as a stand-alone workbook. It consists of 47 Programmed Theory Lessons. The material for each lesson is divided into steps called "frames." Many of the same frames are presented several times for review thus reinforcing fundamentals already presented.